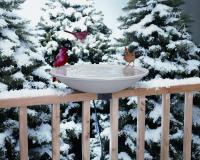 The single most important thing you can offer backyard birds is access to fresh water. With the Allied Precision Deck Mounted Bird Bath, your birds will have a safe place to drink water right from your deck. 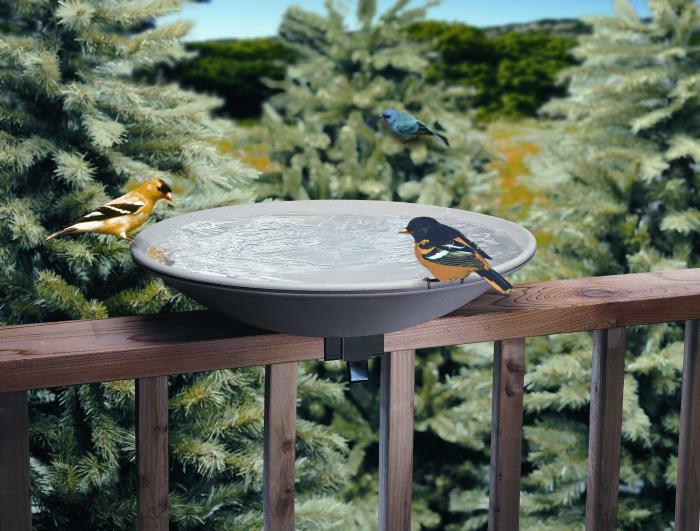 The Deck Mounted Bird Bath is the perfect way to attract a wide variety of species to your yard without needing to install plumbing or connect to a power outlet. 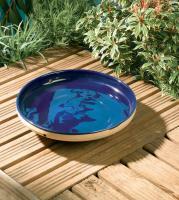 Designed specifically with birds in mind, the bird bath features a gradual slope that encourages birds to bathe while the textured surface and contoured rim gives them a secure place to stand when frolicking. Even though the bird bath is optimized for birds, the designers didn't forget about the consumer. The bird bath easily mounts to a variety of rails and features the convenient EZ-tilt deck mount that makes cleaning and detaching the bowl effortless. Made out of highly durable material, the beige-colored bath can be used throughout the whole year because it will not crack when the weather gets cold. We really like our bird bath though birds are slow to come to it. I think that's more about the location we have it in than anything else. It is REALLY easy to clean. My only concern (which is only very minor) is that it doesn't seem to be latching securely. It is pretty loosely latched right now - though we have not had any problems with tipping and it has already been through a couple storms.